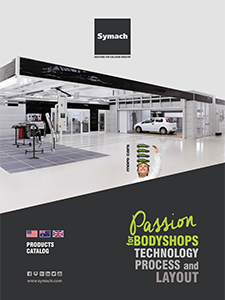 SPAP (Symach Paint Application Process) represents the proper painting method that integrates the use of both Drytronic technology and the robot. Since it dries the paint in just a few seconds, the Drytronic technology enabled us to develop a painting process that significantly reduces flash-off times, as the robot performs the process even faster. Drytronic drying quality is superior to any other drying process involving the use of hot air ovens or electric infrared heaters, because reticulation is instantaneous and 100% complete. The painting product is chemically stable and inert. This prevents the appearance of any future defects, while at the same time allowing for immediate sanding and polishing. The SAP application and drying process – is ideal for all painted products and for any brand name, even using different drying formulas, all while fully complying with the indications provided on the manufacturer’s technical data sheet. The time required to apply the paint to the products is reduced by 60% to 70%, while drying time is reduced by 80% to 90% with respect to any conventional system. This application and drying process allows for filling operations to be completed with a single application, offering superior compactness and quality with respect to the application of two coats using the traditional cycle, in less than half the time. For example, the continuous and uninterrupted filler application and drying takes place in less than five minutes. The filler is applied to the surface to be repaired with a thin and compact initial layer. 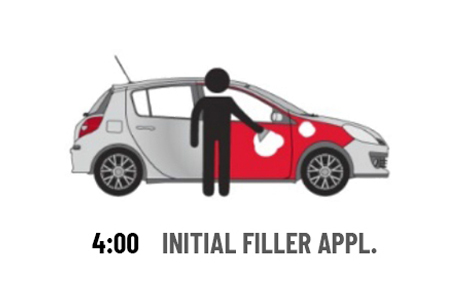 The time required for applying the filler is about 01:00 minute. 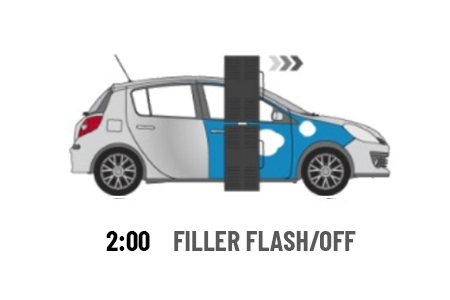 Application of the filler to the sheet metal in a thickness greater than necessary.The time required for applying the filler is about 4:00 minutes. Drying is performed at ambient temperature over the course of 30 to 40 minutes, or else by using an electric IR lamp. 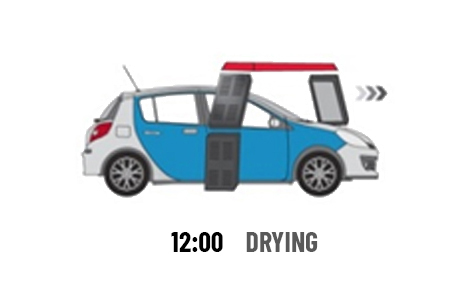 The time required for drying with an electric IR lamp is about 16:00 minutes (2 positioning, 8:00 minutes each one). The first sanding operations do not provide for optimal surface results due to the porosity and the residual undulation of the surface itself. These are caused by the rough modelling of the high thickness application, which does not allow for precise work to be carried out. 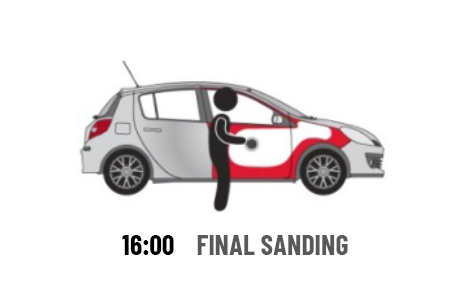 The time required for sanding is about 30:00 minutes. Drying is immediately performed by the robot upon completing the final application of the filler, at a speed of approx. 60 linear cm per minute. 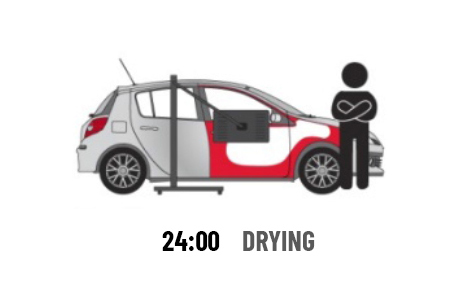 The time required for drying is about 03:00 minutes. The second filler application stage involves the application of a thinner coat of filler in order to eliminate any porosity and undulation. The time required for applying the filler is about 2:00 minutes. The total time required for carrying out the entire filler application cycle on two panels using SPAP system is about 28:00 minutes. 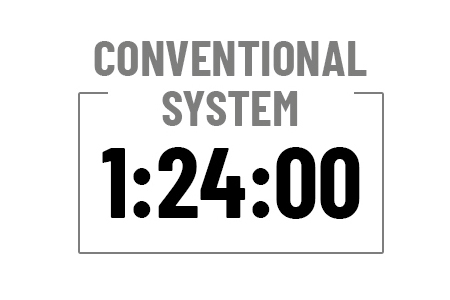 The total time required for the entire filler repair cycle using the conventional system is about 84:00 minutes. The undercoat application process is carried out without interruption, because the flash-off between coats is performed by the robot. 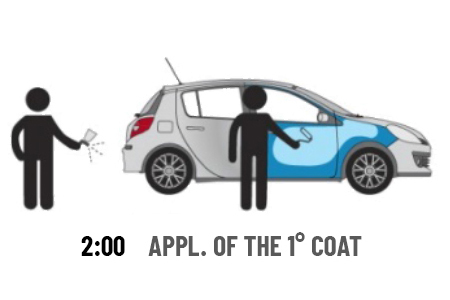 For example, the application and drying of three coats of Undercoat can be performed in less than eight minutes. Drytronic technology even allows for the Undercoat to be applied using a roller, in thicknesses and with application and drying times identical to that of spray applications, but with a 60% savings in paint product and a 100% savings in terms of masking times and materials. The undercoat can be applied with the same process, time and quality, either spraying or roller application. Application of the first coat spraying or roller. The time required for the application is about 2:00 minutes. Application of the first coat spraying. 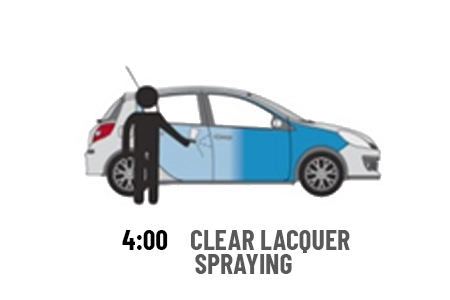 The time required for spraying is about 2:00 minutes. In traditional cycle is not possible to use the roller with the same process and product. 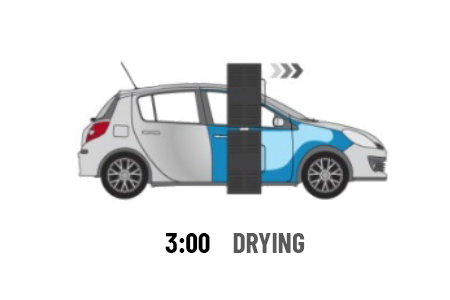 Drying is immediately performed by the robot upon completing the application, at a speed of approx. 80 linear cm per minute. The time required for drying is about 2:00 minutes. Waiting time required for flash-off before applying the next coat. 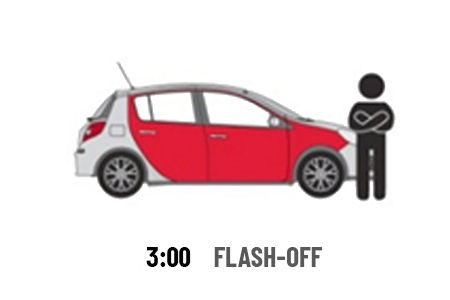 The time required for flash-off is about 5:00 minutes. Application of the second coat spraying or roller. The time required for the application is about 2:00 minutes. Application of the second coat spraying. 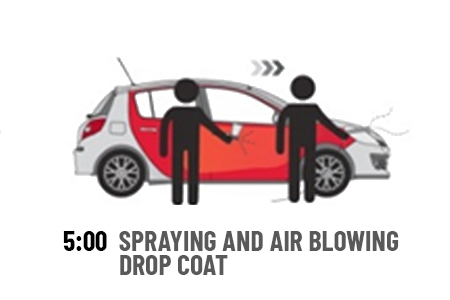 The time required for spraying is about 2:00 minutes. 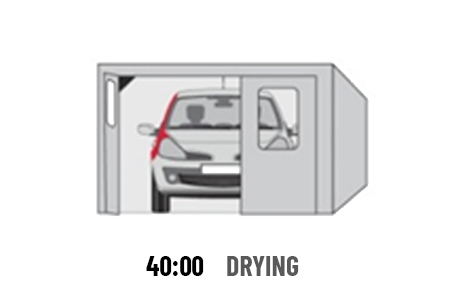 Drying is immediately performed by the robot upon completing the application, at a speed of approx. 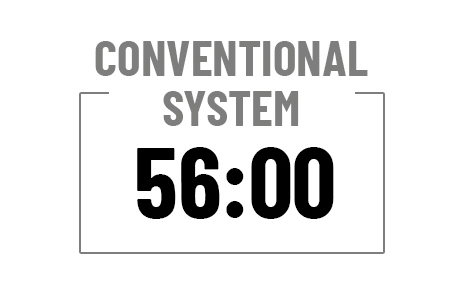 60 linear cm per minute. The time required for drying is about 3:00 minutes. Application of the third coat spraying or roller. The time required for spraying is about 2:00 minutes. Application of the third coat spraying. 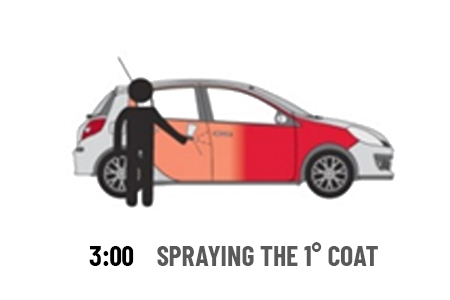 The time required for spraying is about 2:00 minutes. 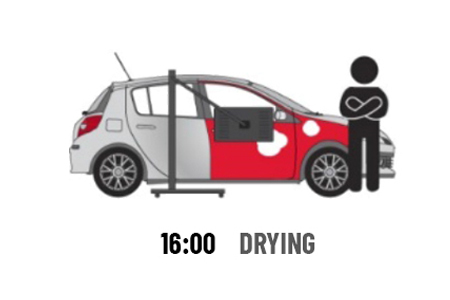 Drying is carried out using traditional methods, with an electric IR heater or a drying oven. The time required for drying is 24:00 minutes (2 potitioning, 12:00 minutes each one). Sanding is carried out immediately once the drying is complete. 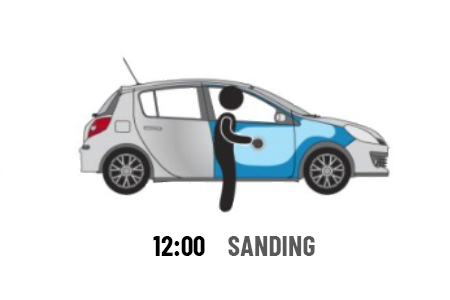 The time required for sanding is about 12:00 minutes. Undercoat sanding. The time required for sanding is about 16:00 minutes. The total time for the entire undercoat repair cycle usin g the SPAP system is about 26:00 minutes. 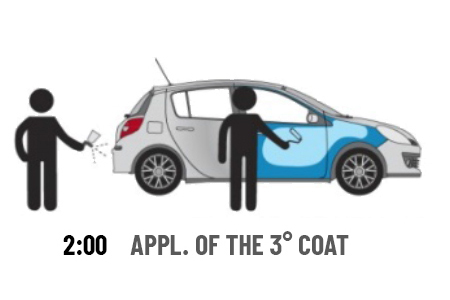 The total time required for the entire unde -coat repair cycle using the conventional system is about 56:00 minutes. 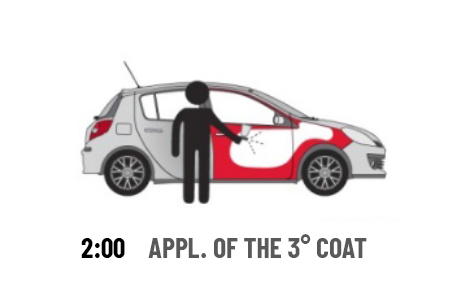 Depending on the brand, the application of the two or three coats takes place consecutively and without interruption. For example, less than six minutes are required for application and drying of three painted panels. 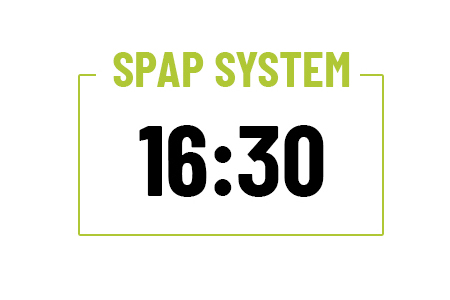 With the SPAP system, the water base is applied in three consecutive coats: 1) Spraying the initial coat; 2) Spraying the full coat (complete coverage); 3) Spraying the shaded coat. 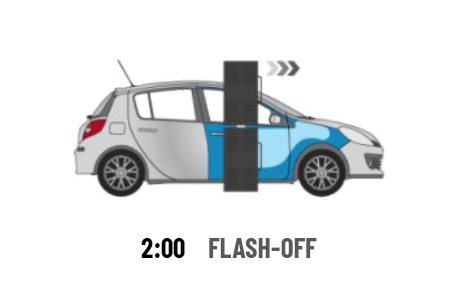 The applications take place consecutively, with no need to wait for flash-off times in between. 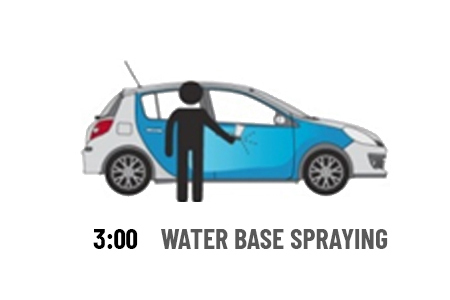 The time required for water base spraying is about 3:00 minutes. The indications above refer to the application of the base with drop coat on wet surface. If applying the drop coat over a dry surface, the work time is extended by about 5 minutes. With the traditional system, the water base is applied in three or four coats, with flash-off intervals involving the use of air blowers. The time required for application is about 2:00 minutes. The time required for air blowing is about 6:00 minutes. The time required for application is about 4:00 minutes. The time required for air blowing is about 14:00 minutes. The time required for application is about 3:00 minutes. The time required for air blowing is about 6:00 minutes. 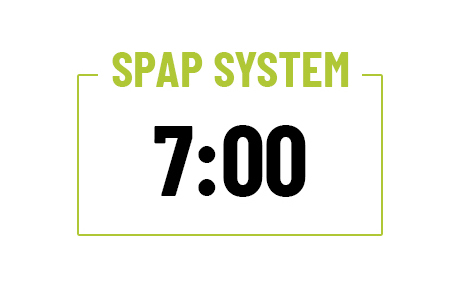 The total time required for the entire water base application and drying cycle using SPAP system is about 7:00 minutes. The time required for spraying and dryingthe three water base coats using the conventional system is about 35:00 minutes. The application of two coats takes place consecutively and without interruption. For example, in order to paint three panels, less than twelve minutes are required for application and drying. The application of the clear lacquer takes place immediately after the water base has dried, with no need to wait. 1) Spraying the first half-coat. 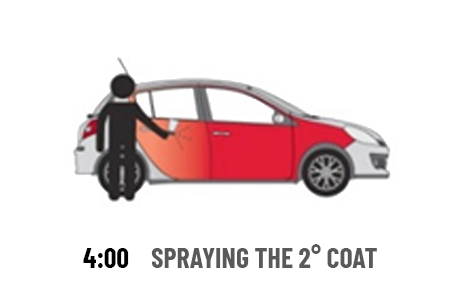 2) Immediately spray the second full-coat, without waiting. 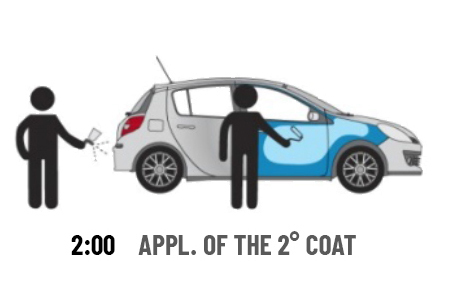 The time required for the application of the two coats is about 4:30 minutes. Spray the first coat. The time required for application of the first coat is about 3:00 minutes. Drying is immediately performed by 2 passage of the robot upon completing the application, at a speed of approx. 80 – 60 linear cm per minute. 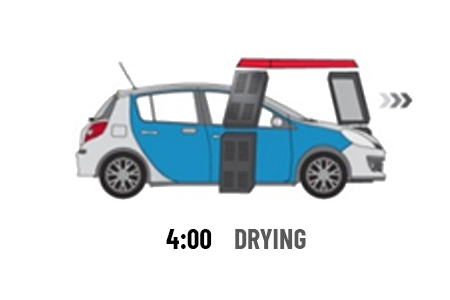 The time required for drying is about 12:00 minutes. Wait for flash-off before continuing with the next coat. 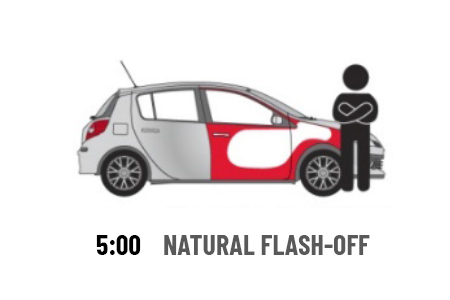 The flash-off time required for the half-coat is about 3:00 minutes. Spray the second coat. 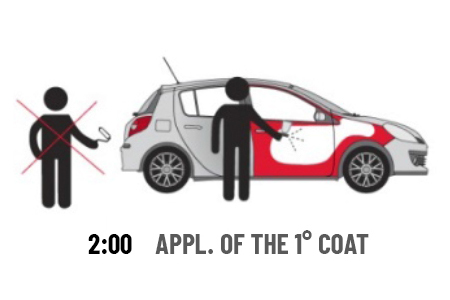 The time required for application of the second coat is about 4:00 minutes. Drying is carried out in the hot air oven. 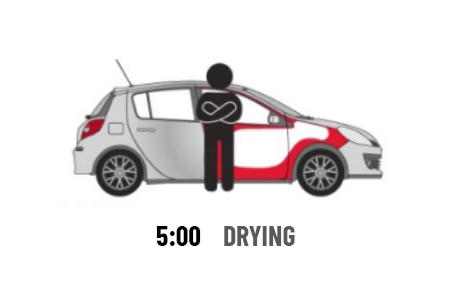 The total drying time required is 40:00 minutes. The total time required for application and drying with the conventional system is 50:00 minutes. The DryTron dries every brand and type of paint in less than a minute and a half. The time previously mentioned can change depending on the brand of paint and during the winter summer climates. The FixStation uses the FlyDry to dry paint.